Whoever predicted the death of the CD was dead wrong! The format lives on, taking its rightful place alongside vinyl, digital and tape in the modern music lover’s collection. Still, the launch of a brand new CD player is a relatively rare event these days, so hats off to Exposure for responding to customer demand. The new Exposure CD player is part of the company’s multi award-winning ‘XM’ series of hi-fi components, which cleverly pack an impressive complement of high-end features and performance into an astonishingly compact, half-width design. The series offers an appealing alternative for music lovers who crave superior audio performance but aren't necessarily in the market for a hi-fi system that risks emptying their bank account or taking over their home. • PCM 1716 24-bit DAC provides very high resolution. • Convenient and high quality top-loading mechanism. • Digital outputs allow use as a CD transport with XM5 integrated amplifier or XM7 preamplifier. • CD display can be turned off using the remote control for enhanced sound quality. • Highly optimised audio output circuitry with multiple stages of supply regulation. • Large toroidal power transformer with separate windings for CD transport mechanism and audio stages. 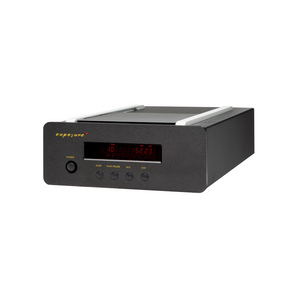 • A high-stability crystal clock reference and dedicated power supply regulator for the transport and audio stages ensure low jitter performance. • High quality double-sided PCBs for optimum layout and screening. • All-aluminium casework and extruded front panel to control unwanted resonance and electro-magnetic fields. Find out more about the Exposure XM series at www.exposurehifi.com.